Scott W. Phillips is a full professor in the Criminal Justice Department at SUNY Buffalo State. He earned a PhD from SUNY Albany, and his research focuses on empirical examinations of police decision-making, police attitudes, and police culture. His works have appeared in the Journal of Criminal Justice, Police Research and Practice, Criminal Justice Policy Review, Policing: An International Journal of Police Strategies and Management, and the International Journal of Police Science and Management, Policing & Society. Phillips has worked as the Futurist Scholar in Residence with the Behavioral Science Unit at the Federal Bureau of Investigation’s National Academy in Quantico, VA. 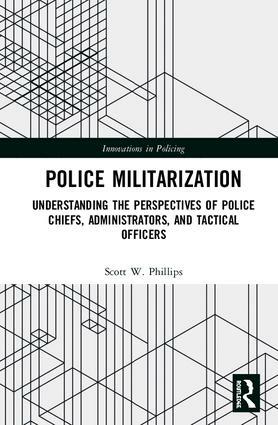 The Routledge Innovations in Policing explores innovations in the field of policing and offers the latest insight into the field through research, theoretical applications, case studies, and evaluations. Famous innovations developed over the course of the late twentieth century and into the turn of the twenty-first include approaches such as community policing, "broken windows" policing, problem-oriented policing, "pulling levers" policing, third-party policing, hot spots policing, Compstat, and evidence-based policing. Some of these approaches have been successful, and some have not, while new innovations continue to arise. Improving police performance through innovation is often not straightforward. Police departments are highly resistant to change, but through such research we expect to find further refinement of our knowledge of "what works" in policing, under what circumstances particular strategies may work, and why these strategies are effective in improving police performance.